The White Dog Blog: Happy Halloween! My mom has totally been falling down on the job with this blogging thing. But now that I am Super Dog I am hoping to stage a comeback! Oh, dont worry mine has too. Its hard to find good assistants ya know!! You look just Super Duncan!! Glad to know it's not just me. Helps me not take it so pawsonally! Good to see you back Super Duncan. We love your blog and have been missing it. Nice to see you Duncan. Have a tremendous Thursday and Happy Halloween to all your family. Hope it is a spectacularly good spooky one. 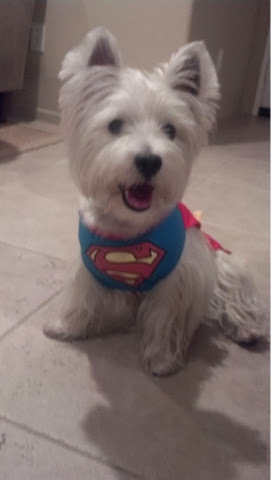 Happy Howl~O~Ween Duncan Super Hero Dog. Wow, look = it's SuperDuncan!!! Happy Halloween from Camp Spooky Kennel. We are super hero's too. whooo hooooo - there you are Duncan! I’ve got the same problem too, although I stole the computer the other night and did some “scheduled” postings - sneaky hey! Anyway, hope you had a grrrreat howl-o-ween! Duncan, we forgive her! I can't wait to see you back again and hear about what you've been up to!